Caster of Black is the Caster-class Servant of Roche Frain Yggdmillennia of the Black Faction in the Great Holy Grail War of Fate/Apocrypha. Caster wears a featureless mask without openings for eyes or a mouth, a full-body suit, and a blue mantle. Due to the mask he wore, it was impossible to tell whether he was afraid or even felt any emotion at all. Caster is noted to be eccentric, and he sometimes does not speak even when addressed, simply nodding in affirmation. He had a poor constitution and pessimistic bent in life, so he had been reluctant to come in contact with other people. He was able to hold conversation with others, but never placed any emotion into the exchange. Due to his specialty in a single type of thaumaturgy as a magus, he never had worries about the miscellaneous chores of his abode. 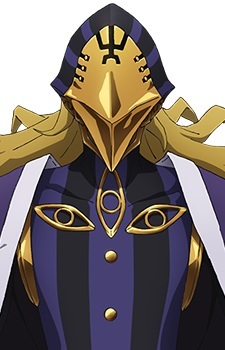 Caster's true name is Avicebron (アヴィケブロン), also known as Solomon ibn Gabirol (ソロモン・イブン・ガビーロール), a twelfth-century poet and philosopher. He was born in Malaga, Spain, and although he did not have the glory of a knight or king or the recognition of having produced works of art that would prosper for thousands of years, he was the father of an entire thaumaturgical system, Kabbalah, and one of the starting points of the process leading up to the European Renaissance through bringing Greco-Arabic and Jewish lore and enlightenment to the cultural circles of Europe. He is recognized as a "hero" who heavily influenced both the history of the world and thaumaturgy. He had suffered from many illnesses during his life, and had spent his days with almost zero contact with other humans. He had even purposefully created maid-type golems to take care of the housework in order to maintain his isolation.